A hoard of Roman gold coins unearthed in St Albans has been bought by one of the city’s museums for nearly £100,000. The trove was found by a metal detecting enthusiast on private land in October 2012 by a man making his first survey. 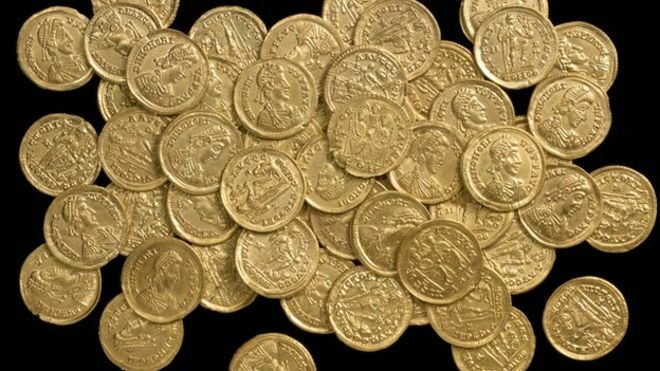 The catch is believed to be one of the largest Roman gold coin hoards buried in the UK. The 159 coins date from the final years of Roman rule in Britain in the 4th Century and will go on display at Verulamium Museum from mid-September. David Thorold, a curator at the museum, said that Evidence suggests the coins were originally part of a hoard that had been disturbed at some point during the last couple of hundred years. During the Roman occupation of Britain, people buried coins for two reasons – either as a sacrifice to their gods or as a form of secure storage, with the aim of later recovery.